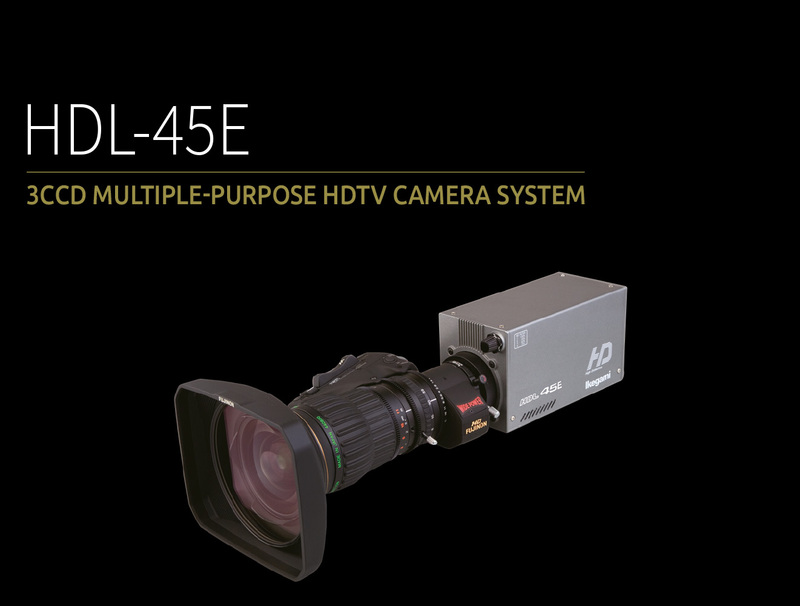 The HDL-45E is a 3CCD multi-purpose HDTV Camera achieving superb picture quality, high stability and excellent reliability with the incorporation of Ikegami’s cutting edge digital technologie. 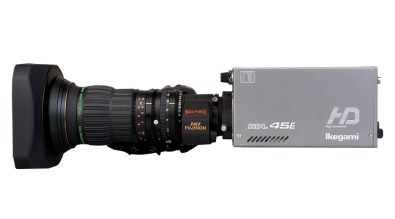 The Camera provides superior picture with newly developed 2/3-inch 2.3 Megapixel AIT CCD, digital processing LSI (ASIC) and the latest 14-bit A/D Converters. With its compact one-piece form, this Camera is suitable for various applications such as a weather camera, news flash camera, POV camera, etc. 2/3-inch 2.3 Mega pixel AIT CCDs are employed to achieve 1000 TVL horizontal resolution, F11 sensitivity, and 56dB SNR. By using 1920×1080 pixel sensors, there is no conversion performed within the camera. The full resolution from the sensors is maintained through to the camera output. 14-bit A/D converters provide a precise picture image from dark to highlight areas, maximizing the color gradation and achieving natural color reproduction especially in the dark areas. The 4-position Optical Filter can be remotely controlled from various remote control panels. Adopting ECC filter (3200k/5600k) gives proper white balance without reducing sensitivity, a benefit under high color temperature but low light conditions such as dawn and dusk. The ND and ECC folter can be independently controlled. Employing a low-noise amplifier in the Master gain up circuit eliminates noticeable noise and obtains a better signal-to-noise with high gain. 3dB steps for gain up through +12dB has been realized to obtain the precise sensitivity required for a wide range sene illumination. 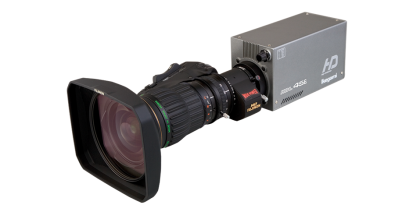 Incorporating Ikegami’s advanced full digital processing ASIC, precision designed at 0.18um rule, the video signals are digitized with 14-bit A/D conversion and up to 38-bit internal digital process circuits. Digitizing white shading, gamma and other correction process in the camera head achieves superb picture quality and high stability. Chip C4 DSP ASIC, originally developed for HDK-series cameras, provides advanced color reproduction and detail enhancement features, including Skin DTL. In addition to HDTV PS and Tri-Sync signals, SDTV VBS and BBS signals can be used as an external sync signal for genlock. *Note: SDTV VBS and BBS signals can not be used for 1080/24psF and 1080/23.98psF. The HDL-45E/E1 has full remote control capability from the complete range of Ikegami remote control panels. 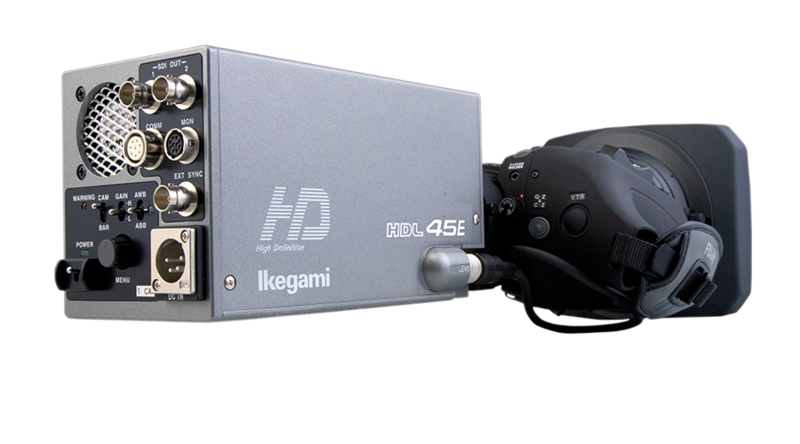 With matching pictures, the HDL-45E/E1 works with the same OCPs and control systems as Ikegami’s HDK studio cameras. And the camera supports ISCP (Ikegami Simple Command Protocol) by menu switching for third party camera control such as PC control integrated with the remote pan and tilt system. In addition to conventional one-push style AWB, incorporating the ATW function adjusts white balance automatically for outdoor shooting with color temperature changes. * Note: The ATW function is only recommended for outdoor shooting. The built-in digital extender expands the center of picture. The expansion can be selected as 1.5X, 2X, 3X, 4X, 6X, 8X, 10X by the camera menu. 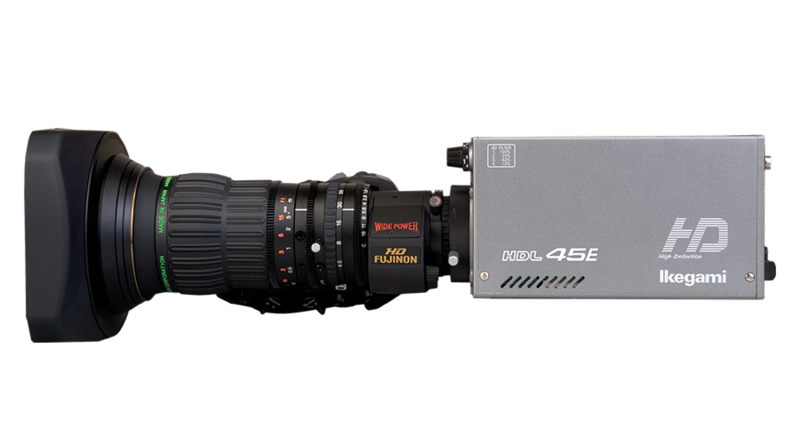 * Note: When the digital extender is used, resolution is reduced as the expansion rate is increased. Column adding achieves four times the standard sensitivity by using 2 horizontal and 2 vertical columns for each pixel. Sensitivity is increased without loosing S/N ratio. The Column Adding function is controlled by the gain up switch, and it is possible to set the operation of column adding by the camera menu. * Note: Trade off of reduced horizontal and vertical resolution, and increased motion blur for vertical. Frame Accumulation from 1/15 sec. to a maximum of 4sec. is available, increasing sensitivity up to 120 times without loosing S/N ratio. *Note: Trade off of increased motion blur and noticeable appearance of white spot pixels as exposure time is increased. By synchronized control of Auto Iris, Auto Gain and Servo Filter, video maintains the same level automatically even though lighting conditions change. Especially for continuous outdoor shooting such as a weather camera application, the camera provides stable video level all day long. Night Mode: Continuous digital gain control. 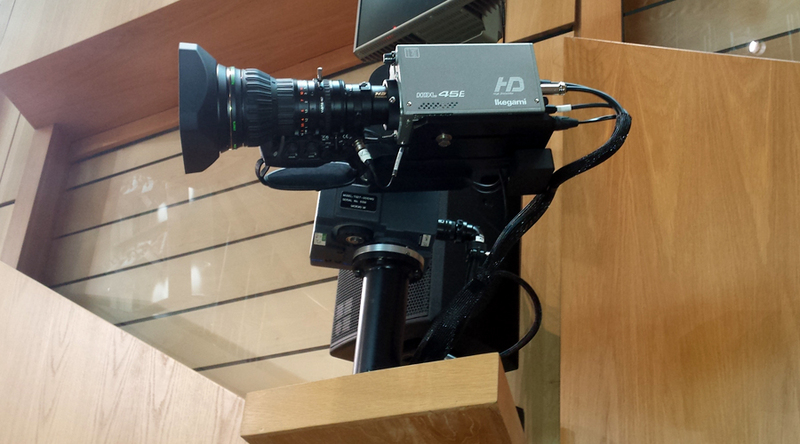 Built-in Horizontal Flip and Line Delay features to support 3D video production when using a beam split type rig.